Summer Chick Pea, spinach, mint and almond salad – Are you tired of the same old salads? Here is a quick-to-put together salad which has some of our favourite superfoods in it- almonds, spinach and chick peas. Perfect for warm summer evenings when you don’t want to cook. Soak the almonds for at least a couple of hours in water before preparing the salad to allow maximum absorption of their nutrients- you can also remove the skins after soaking if you wish to. 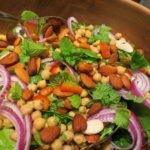 – chick peas (garbanzo beans), red pepper, young spinach leaves, red salad onion, soaked almonds, fresh mint leaves- chopped, olive oil, juice of 1 lemon, cumin, Himalayan salt or sea salt, black pepper, Soak the almonds for at least two hours. If you wish, remove the skins from them after soaking by squeezing one end of the almond. ; Rince and sieve the chick peas. ; Wash and dry the spinach leaves. ; ,Chop the mint leaves roughly. ; Peel and chop the red onion into thin rings. ; Slice the red pepper into thin strips, removing the seeds and the white parts. ; Whisk all the remaining ingredients together to form a dressing. ; Carefully mix all the salad ingredients together and serve. ; – You can omit the almonds if you are allergic to nuts. Try using some seeds instead to still have a crunchy ingredient in the salad. Other nuts can be substituted for the almonds- pecans or walnuts work well. Add or substitute different beans to also ring the changes- such as kidney beans, cannellini beans. Are you tired of the same old salads? Here is a quick-to-put together salad which has some of our favourite superfoods in it- almonds, spinach and chick peas. Perfect for warm summer evenings when you don't want to cook. Soak the almonds for at least a couple of hours in water before preparing the salad to allow maximum absorption of their nutrients- you can also remove the skins after soaking if you wish to. Soak the almonds for at least two hours. If you wish, remove the skins from them after soaking by squeezing one end of the almond. Rince and sieve the chick peas. ,Chop the mint leaves roughly. Peel and chop the red onion into thin rings. Slice the red pepper into thin strips, removing the seeds and the white parts. Whisk all the remaining ingredients together to form a dressing. Carefully mix all the salad ingredients together and serve. You can omit the almonds if you are allergic to nuts. Try using some seeds instead to still have a crunchy ingredient in the salad. Other nuts can be substituted for the almonds- pecans or walnuts work well. Add or substitute different beans to also ring the changes- such as kidney beans, cannellini beans.